Situated in eastern Massachusetts, the City of Lynn is a beautiful community on the northern shore of Massachusetts Bay. Home to roughly 90,000 residents, the city has a long, rich history that is well-preserved in its museums, historical society, and library. 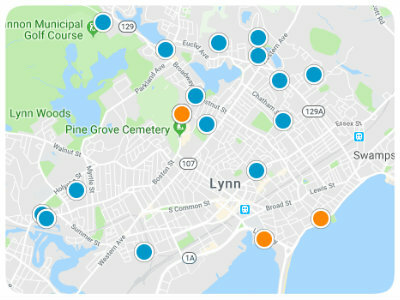 Lynn is the largest city in Essex County and is bordered by the Atlantic Ocean and Swampscott on the east, Salem and Peabody on the north, Revere and Nahant on the south, and Lynnfield and Saugus on the west. On the coastline of the Atlantic Ocean, Lynn is only nine miles north of Boston, fifty-one miles east of Worcester, ninety-five miles south of Portland, Maine, and two-hundred twenty-nine mile away from the only and only New York City. In addition to its intriguing history and fabulous location, Lynn also boasts terrific amenities and attractions. Among its most popular destinations are Manning Field, Frasier Field, Lynn Heritage State Park, Lynn Memorial Auditorium, Lynn Woods, and Gannon Municipal Golf Course. Prospective homebuyers considering real estate in Lynn should definitely consider the homes for sale near Gannon Golf Club. The Gannon Municipal Golf Course was established in 1931 and is located on the edge of Lynn Woods Reservation. It is an exceptional 18-hole championship course that was designed by Wayne Stiles, a famous landscaping architect. For more than eighty years this remarkable Golf Club has been providing Lynn residents with splendid opportunities for outdoor recreation. The course is maintained by the Golf Facilities Management Inc., and Golf Course Superintendent Steve Murphy. The City of Lynn owns the property. In the vicinity of Gannon Golf Club, there are lovely real estate opportunities. Homes for sale near Gannon Golf Course include a wide variety of single-family homes with easy access to Routes 128, 95, and 1. Also in proximity, you’ll find Sluice Pond, Wyoma Square, and Lynn Woods Reservation, as well as excellent options for shopping and dining. If you would like to learn more about available properties near Gannon Municipal Golf Course in Lynn, Massachusetts, please give us the opportunity to assist you and contact us at your earliest convenience.